Notwithstanding his rising unpopularity inside Afghanistan these days, our Chapan-clad and Qaraqul-donning president has always had a way with international audiences, reporters, and dignitaries. From journalists and media-types to fashion designers and heads of state, people have always been wooed by President Hamid Karzai’s charisma, confidence, unfailing optimism, and a flair for always giving the good news -regardless. I found this out for myself a couple of years ago when I was at a a gathering in D.C. where Mr. Karzai spoke about Afghanistan. I could sense myself identifying with the full-house audience who palpably adored him. Given that his talk about the situation in Afghanistan was not entirely congruent with reality at the time, for about half an hour he made Afghanistan seem a cool and attractive place, the US a compassionate hegemon, and the world a beautiful place. There was so much love in the air that evening I could have kissed the visiting fellow from Tokyo University who sat right next to me. On his cheek. I decided to let go and allow myself to bask in the optimism that he radiated that evening. And so did the standing audience who also forgave him the half an hour late arrival. Given all the bad news, he came across unmistakably reassuring and confident about a brighter future. He probably exasperated a number of realists, Democratic policy-makers, and a few Afghans, but they were in the minority and they dared not be party-poopers. At one point the person introducing him turned to the audience and said: “I hope you realize you’re looking at the equivalent of George Washington, the kind of man that has to build a new country…” The analogy was clearly inapt and historically incorrect. But it did not matter. We were in the presence of greatness, and he was glowing -literally, after he took off his Qaraqul hat. At one point I even got the feeling that I was in a huge rock concert and the president was a living legend, a rock superstar -and it occured to me how it must feel to moshpit and crowd-surf with the business-attired audience who were galvanized and spell-bound by the performance. So what is a person like Mr. Karzai to do when surrounded with more and more bad news? With the bitter pungency of failure poisoning the air around? And coming face to face with that old enemy of all idealists everywhere: reality? Change of atmosphere does wonders for clearing up a troubled mind. Take the example of friend and comrade in the war on terror, President Bush: when the small-mindedness and political bickering of Washington becomes too much to bear for him, President Bush retires to the peace and quiet of good old Crawford, Texas. A peaceful and unconfusing southern town where things are what they seem, and a person can relax and not worry about a thing in the world. Cherishing southern wholesomeness and hospitality. South and hometown are two places Mr. Karzai cannot possibly associate with wholesomeness and hospitality. His own southern hometown of Kandahar is where Mr. Karzai would do best to steer clear of. Too much noise and explosion and stuff blowing up there. So what does Mr. Karzai do? 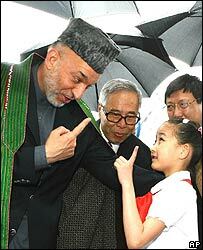 Well, aware of his darling status in the international limelight, when times are low, Mr. Karzai emigrates. He leaves country. He opts for the hagira option. Exodus. With a sumptuous entourage of his aides and favorite cabinet ministers. You are currently browsing the Safrangُ blog archives for the day Saturday, June 17th, 2006.